IPS Group are pioneers in the field of green roofing, and specialise in the installation of sedum, grass and wildflower roof solutions. The process of ‘urban greening’ is not only advantageous for the environment, but beneficial to businesses too. IPS are fully trained and have many years of experience in the installation of all types of green roofs & bio-diverse systems. The construction industry has seen changes in building technology as a result of climate change; solar panels, water harvesting and green building materials to name a few. However, few other green building technologies combine as many benefits and opportunities as green roofing. Our specialist partner, Active Ecology, is one of the UK’s leading innovators in urban greening with over 30 years of experience. We supply and install all types of intensive, extensive and bio-diverse green roofs, sedum roofs, grass roofs and living roofs as well as supplying and installing green walls and living walls across the UK. Green roofs encourage biodiversity, which is especially important in urban areas. Specialist sedum or grass roofs encourage a wide range of wildlife, help improve air quality, and create a pleasant aesthetic for workers to enjoy. This type of sustainable roof also has excellent insulation properties, preventing heat loss from buildings, but allowing cool air to circulate in the warmer months. This practical, effective form of insulation reduces heating bills, offering good return on investment over time. Green roofs can be tailored to suit your specific requirements. Simple sedum roofs offer good coverage, and wildflowers offer an attractive feature for your business premises. IPS Group also install green and living walls to complement green roofs. Economics: green roofs absorb solar heat and reduce the need for air conditioning or heating so they save money and cool your building. Feel Good Factor: green roofs look good in any work or home environment and encourage wildlife. Environmental: reduction of water run off (SUDS), CO2 and Oxygen replenishment. Planning requirement: many local authorities now insist on the inclusion of green roofs in building developments. Reduces water run off: green roofs can help to reduce rain water volume rate of run off entering the drainage system. Offsets carbon emissions: by absorbing CO2 directly. Prolongs the life of your roof: protects the roofing material from external influences such as the sun, rain and wind. Saves money: normal roofs deteriorate and end up needing to be replaced sooner. Establishes new wildlife habitats: green roofs have been shown to provide new homes and hunting grounds for a range of creatures including beetles, spiders, and other invertebrates. Green Roofs can deliver enormous benefits. 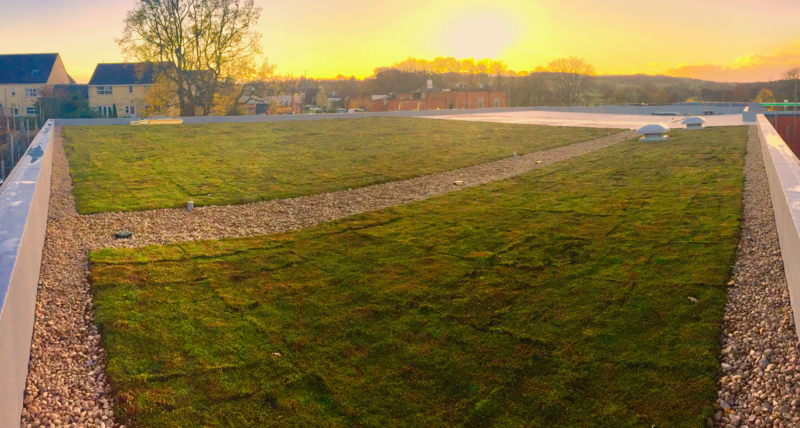 With over 30 years experience using vegetation as an engineering tool, our expertise ensures that whatever drives your green roof project, be it sustainability, ecology, aesthetics or amenity space, we can provide a scheme tailored to your needs. From wildlife habitat of a Bio-Diverse roof, to the breathing space of intensive roof gardens, Active Ecology and IPS green roofs encompass all your possibilities.